I love Beaujolais-Villages. That’s right. I said it. Sure, those from the Cru villages in Beaujolais get all the glory and praise while those that are designated as Beaujolais-Villages don’t get taken too seriously. But, see, that’s EXACTLY why I love them. You shouldn’t get all serious and wine-snobby about Beaujolais-Villages because of its fun and spirited character. 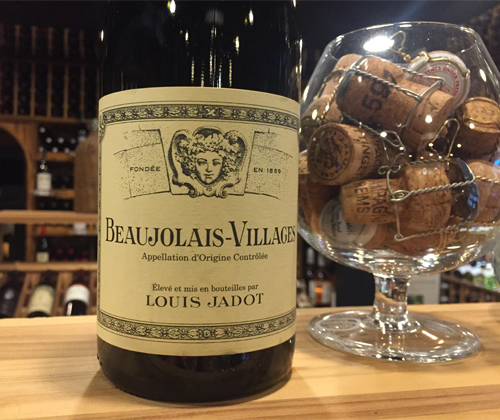 Jadot Beaujolais-Villages is a staple red wine for me when things get hot. Not just because it's low in astringent tannin, but when you give it a slight chill it becomes refreshing and even more bright and expressive than it already was. This wine has a rich body with a soft mouthfeel, aromas and flavors of strawberries and dark cherries, with a peppery and minerally finish. It's simple and happy. You can pair it with grilled meats or cheeseburgers, but it's also the perfect wine for mac ’n cheese or peanut butter & jelly sandwiches. Please serve slightly chilled. The bottle used was purchased by myself for the purpose of this review. To have your wine reviewed follow this link. Darth Vader just won't quit.